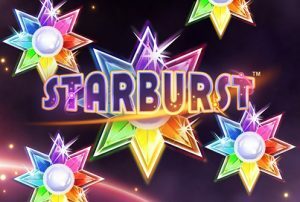 Starburst is the gateway to online casino for many new players! With so many no deposit free spins offer it is often the first game players are exposed to when embarking on a new casino journey. Starburst is a great game for casino online newbie it delivers a good level of action and the wins are frequent too. Many high rollers are also mad about this game and the forums are filled with big winner stories and videos. Even if NetEnt comes with new game releases every month, no other games are as popular as Starburst. Could it be because this game offers multiple win possibility since it’s a win both way video slots? Or maybe it is because it is a modern take on a classic video slot. Gemstones games have always been popular with casino players and this one top all chart when it comes to game play both on a desktop and on mobile. The minimum amount you can spin at is 1p per line, and the maximum amount is £100 per spin. The reel formation is also classic and has 10 flexible lines, 5 reels on 3 rows. When you play Starburst, you can win up to 50,000 coins. The game features are re-spins and expanding Wilds. Make sure to visit Ikibu casino, Casumo or IGame Casino as they offer free spins no deposit required to new players. You may need to validate your account to activate this offer and remember that you can only claim one offer per IP and per device too. Starburst has 7 feature symbols and only the highest win per active bet line is paid by the win both way feature. The Starburst logo is the Wild can be displayed both as a single symbol or as an expending one depending on the payline it lands on. The BAR symbol pays the most and five will give you 250 coins. The second best-paying symbol is the 7 and five identical symbols will award you 120 coins. The gemstones are the most basic symbols in this game and the yellow one pays the most as five will give you 60 coins. The green gemstone is the second best-paying stone followed, the red one, the blue one, and lastly the purple one where 25 coins will be awarded to you for five identical symbols land on one payline.